alaTest a collecté et analysé 53 avis de consommateurs et d'experts pour le produit Dualit DCM2X Coffee System and Jug. La note moyenne du produit est 3.5 sur 5, tandis que les autres produits de même catégorie ont une note moyenne de 4.2 sur 5. Les testeurs apprécient le bruit. L'ergonomie impressionne, mais de nombreux avis ont des doutes sur la taille. Après analyse des notes de consommateurs et d'experts, de l'âge du produit ainsi que d'autres facteurs, et comparé aux autres produits de même catégorie, le Dualit DCM2X Coffee System and Jug obtient un alaScore™ de 86/100 = Très Bien. I have run a coffee shop and this is a good a Barrista machine. The one product I did not like and that was the Dualit coffee pod bags, in my opinion they are too weak of a coffee. Very easy to set up, very easy to use. Quality product that met my expectations having purchased other Dualit products. Instructions easy to follow. 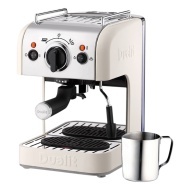 Performs as stated and makes great cappuccinos! Looks stylish and easy to clean. Takes a day or two to master, i.e heating cup and jug through and putting personal amount of ground coffee into holder after doing that, but then it makes hot coffee as good if not better than coffee shops ! British company ! Unrealistically impractical and not Dualit quality! I'm on my second one. Th first lasted over 5 years. It's such a good machine. Some of the negative comments seem to be derived from people using the wrong coffee. This is the second one of these machines I have owned. The last one lasted over ten years. If this one lasts as long I think that is excellent value. It also makes great coffee. Great service as always with John Lewis.